For a quick summer getaway, escape to the hills of Bhimtal. Now that summers are here, a great place to escape from the heat is to the hills; and what better place than Bhimtal. About 6 hours by road from Delhi, Bhimtal is your perfect weekend getaway; famous for its glistening lake and rolling mountains. It offers a quiet vacation to the traveller and also has facilities for water sports, in case you want a dash of adventure. Located at an altitude of 1,371m above sea level among the Kumaon hills, it is hardly 23km from Nainital. The weather in Bhimtal is alpine; the summers from April to June are mild and winters from November to February are quite cold. The monsoons last here from July to September. However, if you want to make the best of what this hill station has to offer, visit during summer. Though the origin of this small town is obscure, legend goes that Bhimtal got its name from Bhima, a legendary character mentioned in the Indian epic of Mahabharata. The most stunning attraction here is its enormous Bhimtal Lake; one of the largest in the district of Nainital. You must opt for boating and fishing when you’re here. There’s also a beautiful island with a restaurant in the middle of the lake, where you can have a nice, simple meal with your loved ones. Travellers must also explore the region around the lake; trekking and nature walks are a must here. The lush green surrounds, and the flora like dog rose, wild raspberry and citrus trees laden with fruits dotting the landscape make this place a treat to the eyes. A rather prominent place of worship in Bhimtal where devotees flock to every year is the 17th-century Bhimeshwar Temple, famous for its gorgeous intricate architecture. The nearest airport from Bhimtal is at Pant Nagar, about 55km away, and the nearest railway station is at Kathgodam, some 23km away. 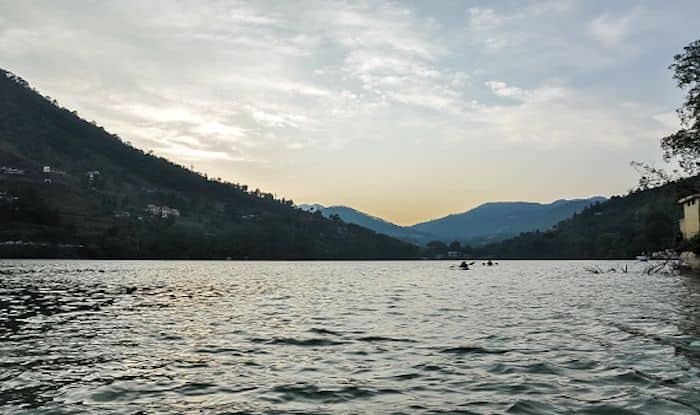 Bhimtal is also well connected by road with Nainital and Kathgodam.